Have you ever wished you could just move your bungalow to the centre of Ottawa along the Rideau Canal and enjoy the best the urban lifestyle has to offer? That’s how you’ll feel when you step into this beautiful spacious condo – At nearly 1600 square feet with gracious entertainment areas and with it’s great location on the second floor, you’ll feel like you just moved your home downtown. A big difference of course is that now your balconies and rooms overlook manicured gardens, trees and parkland that are all maintained for you. With the combined massive Living and Family room area and two large balconies – you’ll enjoy superb entertaining space. Move from there into the formal dining room with lots of space for your treasured dining room set and then into the beautifully renovated eat-in kitchen. The kitchen provides lots of cupboards, convenient pot drawers and loads of counter space with beautiful granite counters and glass backsplash. There is also a water line installed behind the fridge should you choose to add an icemaker. Two large bedrooms, the master comes with a full 5-piece ensuite and both bathrooms have also been beautifully renovated. Laundry is also in-suite. 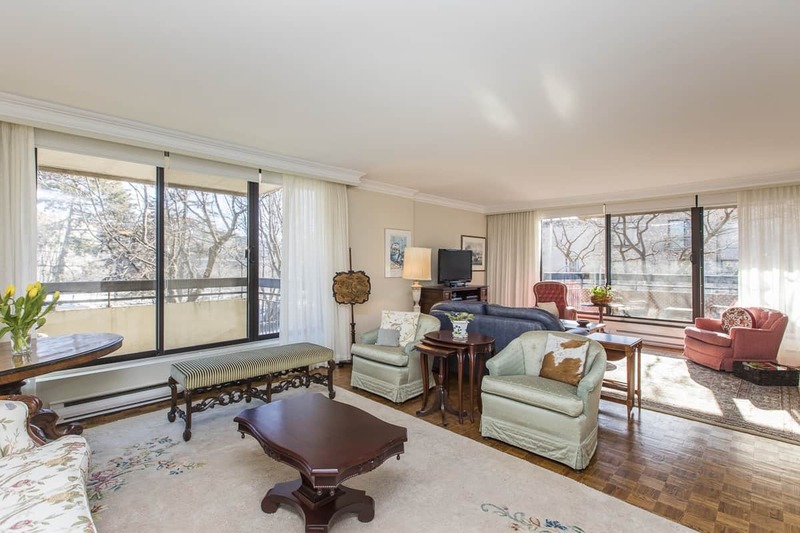 Move-in sit back and relax and enjoy your balconies and watch the larger boats go by on the famous Rideau Canal. Or the joggers, skaters or cyclists. The second floor location means you can easily keep in shape by using the stairs – just one flight separates you from walking along the canal. Add to that some great amenities that come with the building such as such as gym, wonderful indoor pool, billiards,bbq and patio area, guest suite and more. The condo is very well run and you have a wonderful superintendent lives on site. Recent updates include new bathrooms, new kitchen, replastering of the ceilings to remove the stipple look. Click on the attachments below to view more details such as condo fees, taxes, room sizes and floorplan. Location Location – a premium Ottawa address – located in Ottawa’s Exclusive Golden Triangle alongside the World Heritage site that is the Rideau Canal, just blocks from the the hustle/bustle of Ottawa’s downtown and Byward market, yet walkable to everything and also just across the footbridge from the new light rail station by Ottawa University. Check out the amazing walk and transit scores below!